Put it this way, when Taylor Martinez is good, he’s very, very good. And when Nebraska’s junior quarterback is bad . . . remember those three interceptions against Ohio State? But the three interceptions, and a lost fumble when the game had been decided, reflected issues shared by his teammates on both sides of the ball. The 63-38 loss couldn’t be laid solely on his shoulders. “I think if we can keep him clean, he’s going to make his reads and he’s pretty dang good,” junior offensive tackle Jeremiah Sirles said of Martinez. The Huskers’ 29-28 victory at Northwestern was a case in point, specifically the final 8 minutes and 31 seconds. Martinez was pretty dang good. 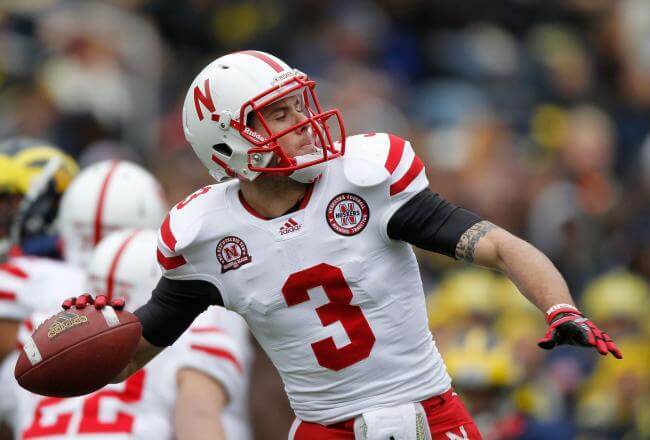 Northwestern had just taken 28-16 lead, to put Nebraska in dire straits. The Huskers had rallied from a fourth-quarter deficit of as many as 12 points only twice in school history, and though Martinez had played well to that point, there was no reason to expect what happened. He needed only 2 minutes and 36 seconds to direct a 10-play, 80-yard touchdown drive to cut the deficit to 28-23. Direct? He also played the lead role, rushing twice for 14 yards and then throwing eight consecutive passes, five of which were complete, the fifth for 8 yards and a touchdown. Redshirted freshman Taariq Allen caught the touchdown pass, the first of his career. Then, after the Nebraska defense forced the Wildcats to go three-downs-and-punt, as it had done nine times previously, Martinez directed a six-play, 76-yard touchdown drive that required 2 minutes and 2 seconds and gave the Huskers a 29-28 lead. Direct? Again, Martinez played the lead role as well, rushing once for 2 yards and completing five-of-five passes, the fifth to tight end Ben Cotton for the touchdown. “Taylor stepped up unbelievable, like I’ve never seen him do before,” said Sirles. “I mean, he stepped up, and he was such a leader. He was vocal. He was demanding in the huddle. He demanded respect . . . he demanded people listen, and I think that he pulled us through there. The performance earned Martinez recognition as the Big Ten’s “Offensive Player of the Week” for the third time this season, and kept the Huskers in contention for the Legends Division title and a trip to Indianapolis for the Big Ten championship game on Dec. 1. A predictable question at coach Bo Pelini’s Monday news conference was whether the performance was a “game-changer” for Martinez, who was a focus of criticism following the Ohio State debacle. “I don’t know,” Pelini said. “I think Taylor has played at a pretty high level all year. You take away some of the plays that happened to him at Ohio State, and I think he’s played really well all year. Cotton wasn’t willing to call it a game-changer, either. “Honestly, for me, having gone through practices and a lot of games with him, that’s Taylor,” said Cotton. “No matter the situation, no matter the score, no matter how late in the game it is, he’s going to stay calm. He’s going to stay confident, and he’s going to do his thing in the backfield. Remaining calm, and steady, will again be essential for Martinez when Nebraska plays divisional leader Michigan at Memorial Stadium on Saturday night. For some, the game will come down to a match-up between Martinez and versatile Wolverines quarterback Denard Robinson, among only eight players in NCAA history to rush for 40 touchdowns and pass for 40 touchdowns during his career. Husker fans will, though. And they’ll expect Martinez to do more than just direct. They’ll expect him to be good, very, very good.